Scientists announced yesterday (Feb. 2) that NASA's Kepler mission has discovered 1,235 alien planet candidates, including 54 that orbit in their host stars' habitable zone — that just-right range of distances that allow liquid water to exist. 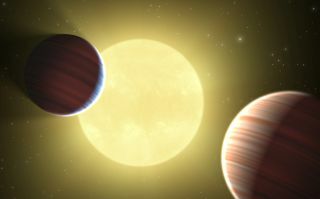 If a significant portion of these candidates are subsequently confirmed, Kepler may have just doubled — or tripled — the number of known exoplanets, which had stood at about 520. Not bad for its first four months of data collection. The Kepler Space Telescope launched in March 2009, tasked with searching for Earth-size alien planets in their stars' habitable zones. The telescope's science mission will run through at least November 2012. Yesterday, SPACE.com caught up with the Kepler mission's principal investigator, Bill Borucki, of NASA's Ames Research Center in Moffett Field, Calif. Borucki discussed Kepler's latest finds, how the mission can help astronomers better understand planetary systems — and how it's likely to shape our search for life elsewhere in the galaxy. SPACE.com: So, how do you feel today, after announcing Kepler has found more than 1,200 planet candidates? It must feel good to show the world what you guys have been up to. Bill Borucki:It does feel very good. We spent a lot of years, we spent a lot of money, a lot of time, and it's nice to see the product. The product is basically game-changing. It will help people — dramatically help — understand planetary systems, how our own solar system may have come into existence. It gives us lots of hope that we will find Earth-size planets in the habitable zone. We are finding some candidates in the habitable zone right now, and so as time goes on and we find the ones that are around hotter stars more like the sun — everything looks good. I think everybody's happy with the productivity of the mission. SPACE.com:So how many of these 1,235 planet candidates do you reckon will eventually be confirmed? Borucki:My feeling is, it'll be better than 80 percent. So, something short of a thousand of them. SPACE.com: Wow. That's very exciting. Borucki: It really is, in so many ways. We really don't understand the structure of some of our planets. For example, if you're interested in saying, "I want to know how Jupiter and Saturn were constructed" — the gas giants. One of the theories is that you build up a rocky planet like the Earth, but you keep building until it's maybe twice the size, or three times the size. Then the hydrogen and helium condense out, and you form a Jupiter. Well, let's go look at Jupiter. Jupiter doesn't have such a core. Now, isn't that odd? The main prediction of your theory doesn't work on the most prominent planet in your own solar system. There are a lot of things like this that are puzzles to us, understanding our own solar system. And by looking at another variety —tens or hundreds of other solar systems — we'll begin to understand what really goes on in developing planetary systems, and developing planets. So it's just a tremendous amount of new knowledge. One of the people at headquarters today was saying, "We're writing the book on planetary physics." SPACE.com: With such a big sample size of alien planets, people will be able to start making generalizations that they couldn't make just a few years ago. Borucki:That's right. And in fact, it wasn't that many years ago that we only had one solar system, and that was our own. And people would build models: How was this formed? So they'd imagine a bunch of rocks getting together and colliding and breaking and merging and so on. And finally, you build a solar system. And most of the models did not predict our own solar system. So they just threw the models away. They don't work, obviously. Well, of course. Your model may have worked, it's just that you didn't recognize that our solar system is rather unusual. SPACE.com: Kepler has already found 54 candidate planets in their stars' habitable zones. But there are some discoveries that will take more time to make. Would extending Kepler's mission beyond November 2012 make a big difference? Borucki: It really would. It would do several things, one of which is, as you go to hotter and hotter stars, the habitable zone moves farther and farther out. It takes longer to get to the three orbits that are required to have a confirmation. So that means that if you go to six years, now you can go and look at stars hotter than the sun and look at their habitable zones, and that's a huge improvement. But you also can find out that the smaller planets you couldn't find in the older data you can now find, because there are enough transits. We're finding planets that are a little over half the size of Earth. That's Mars-size. And you will find more of those around these systems if you just look longer. The Mars-size planets, of course, are very close to their stars, so they give you enough transits in a few weeks, or a few months. But you really want to find Mars-size planets out near the habitable zones. And you just need to look longer. So there are a lot of ways you gain. SPACE.com: You've said that Kepler is a first step in the search for life beyond Earth. So what are some of the next steps? Borucki: Well, there's several. These things often work in parallel — there's a breakthrough in one, then a breakthrough in another. The National Academy of Sciences has pointed out that the next missions ought to do things like finding the closer planets and, in particular, getting at the atmospheres of planets. To do that, there are two approaches. One is called a coronagraph, which you take the light in a telescope from a star and you basically put a black dot where its focus is, and the light's gone, it's just absorbed. But the light from around that star goes through your telescope, and you get an image of the planets that are around it. That's called the coronagraphic approach, and it works the best if there are lots of planets around the stars, because it doesn't have a long range. But if you say, "No, there aren't very many Earth-size planets in the habitable zone," then you want something with a longer range. That's the big interferometers, which are multi-mirror systems, sometimes floating independently in space, all controlled with little reaction motors. But the first one, the coronagraph, is very expensive. The second one is extremely expensive. The National Academy of Sciences has said, "Well, figure out which of these situations is the case, and then build an instrument appropriate to the task." They've recommended that people wait and find out what Kepler tells us — how many stars are likely to have planets, what kind of stars would have these planets, and so you can go and build an instrument that's going to work. And so that's one area that we will, I think, see Kepler contribute to. And we will see new instrumentation in a few years, when Kepler starts giving us the final answers that we want. New instrumentation for spectrometers, new instrumentation for telescopes and, of course, new space missions all are required to make the progress that we all want. When Kepler's done, we're not going to be satisfied. We're going to say, "I want to know whether those planets have atmospheres." SPACE.com: Next-generation instruments will be needed to check out those atmospheres. Borucki: That's right. Once you get at the atmospheres, you're going to ask lots of questions. Does it have water? If it doesn't have any water, that's not a good sign. Does it have any oxygen? Well, that's really a good sign, because most atmospheres, even with life, wouldn't have oxygen. Creatures have to be pretty advanced to generate oxygen. SPACE.com: Missions capable of scrutinizing alien planets' atmospheres like this — such as NASA's proposed Terrestrial Planet Finder — aren't close to getting off the ground. So there will probably be a big lag between Kepler's finds and following them up in detail. Won't that be frustrating to a lot of people? Borucki: Yes. And in fact, one of the things that Kepler might do — if we were to find that many stars have Earth-size planets in their habitable zones, then I think a lot of people would ask NASA to move forward, to bring these projects forward, and not wait for 20 years. And Congress, and the president, might say, "Well, these are examples of innovative technology, and we'd like to see those things start early." So that might very well happen. I'm optimistic. SPACE.com: Kepler is finding lots of planet candidates already, looking at just one four-hundredth of the sky. That really suggests there are millions and millions of planets out there, right? SPACE.com: So do you have a gut feeling about whether we're alone in the universeor not? What do you think? Borucki: Well, isn't that a great question? People have written books about it. What's the book that Ward and Brownlee wrote? “Rare Earth,” I think the book was called. And what they point out is, just imagine that you've got lots of planets. And they have atmospheres, and they're in the habitable zone. But there's a whole stack of things that might prevent life from being there. They go through a lot of different possibilities. So the answer is really unknown. There's just no way of knowing the answer to that. And, of course, that makes it an interesting question. And similarly, you could have asked the question, "Well, are there Earths out there?" 10 years ago. And there would have been no way of knowing. What you have to do is, you have to go out and make the measurements. Up to then, you're guessing. So with respect to, "Is there life in the solar system?" Go out to Mars and make the measurements. Go out to [the Saturn moon] Enceladus — go into the oceans and look. And when it comes to that question for other stars — build robotic systems, send them to these systems that show the existence of planets, and let them go and find out. So, I simply know that we're going to have to be patient. There will be gaps. But if you want the answers, and the answers are valuable, then you need to make the effort to find out what the answer really is rather than just speculating. Because speculation never really gives you anything useful. SPACE.com: That's why Kepler is so valuable, because it's going out and putting some numbers on things, so we don't have to speculate quite as much. Borucki: And if the answer is, "No, there aren't any Earths" — you get that answer. You may not like the answer, but it is the answer. Whether we get a zero, or we get 100 percent, that answer's going to be extremely valuable. And the mission was designed so that a zero could be obtained, and it would be a meaningful zero. It really would mean that there are very few Earths in the habitable zone. That's important. Null results should be important, if you're going to pay for one of these time-consuming missions to build, and expensive missions to fly. SPACE.com: Right. But just in the first few months of data, Kepler's gotten 54 planet candidates in the habitable zone, some of them roughly Earth-size. So it seems to suggest that there could well be alien Earths out there. Borucki:It's certainly suggestive, in that we are finding a lot of small planets. And that's a great harbinger of what we expect to find as we move to longer orbital periods, farther out in the planetary systems. SPACE.com: You've said that we shouldn't expect quite as many planet discoveries from Kepler as time goes on, because it's picking up the low-hanging fruit relatively early. What's your best guess about how many planet candidates Kepler will have found if we were to have this conversation, say, two years from now? Borucki: We would be talking about the ones that we've found. We'll find more of these. But the real question is, What about the ones with the long orbital periods that we can only find in a couple of years? We know the probability goes down significantly. But I guess it wouldn't surprise me in a couple more years, after a couple more years of data and our pipeline increases, that we might do as much as doubling what we have. I don't think it'll be any more than that.